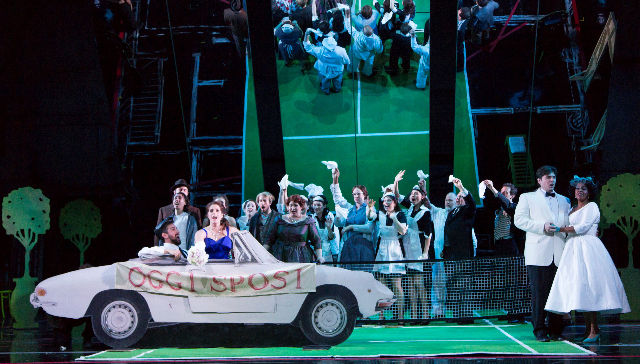 As the final production of its celebratory 40th anniversary season the Boston Lyric Opera presented a light, fleet, amusing “Marriage of Figaro,” featuring a young cast that fully inhabited their roles, able to act as well as sing. There were no real stars in this production – indeed, all the singers were stars - which was appropriate: the opera is a text-dominant ensemble work that aside from a pair of arias for the Countess and a few others doesn’t lend itself to characters stepping forward and delivering a knock-out solo. Of course, the opera, arguably Mozart’s greatest achievement in the form, is full of beautiful music, solo arias among them, but ensembles – duets, trios, quartets, sextets, nonets, etc. - dominate the musical composition. Coming so soon after the end of the highly formal era of aria-centric Baroque opera, when even duets were rare, it must have seemed a revolution to the audience. (Especially those members of it who hadn’t paid much attention to Gluck’s “reform” opera.) No wonder its first audience in Vienna didn’t really like it. The critical attitude toward the aristocracy it expressed also didn’t help to endear it in the capital of the Empire. It wasn’t until it played in Prague that it became a hit, an example of the second city knowing what was good before the big town. Before we get into the opera performance itself, a word about this 40th anniversary season. The BLO seems to have gone all out, expanding its outreach programs, collaborating with other local institutions, taking over Sarah Caldwell’s old Opera House, now primarily a venue for Broadway roadshows, for its season opener, a thrilling production of Bizet’s “Carmen,” and most of all focusing on the quality of its productions. This season’s four operas, even if the products of different directors and designers, seem to have been thought about as a cohesive statement. Even though they ranged in time from an opera written in 1786 to one premiered 200 years later, Mark-Anthony Turnage’s “Greek,” a punk updating of the Oedipus myth, they all seemed to be contemporary, not just because they were set in recent times, but because of their spirit. Whatever their pedigree, they spoke to us without the old and fusty formulas too much opera still depends on. They were all of the moment. It was the most successful season the BLO has put on in the seven years I’ve been covering opera here for Berkshire Fine Arts. Let’s hope it will be the model for many years to come. Of course, problems remain for the company which one successful season will not erase, not to mention for opera in general. The mighty Metropolitan Opera shot itself in the foot with its innovative HD transmissions, which have become so popular it can barely sell tickets to its live performances, as Susan Hall has reported for berkshirefinearts.com. For the BLO the problems that remain are more existential – first off, it doesn’t have a theater to call its own, and after it dissolved its relationship with the Shubert Theatre, it has been nomadic. Of course, there is nothing inherently wrong with not being weighted down with a theater – I bet the administrators of the Met, the San Francisco Opera and the Lyric Opera of Chicago frequently wish they could escape the white elephants they are saddled with. And let’s not forget that Sarah Caldwell did much of her best work when she didn’t have her own theater. But the BLO needs a theater it can call its own, and its efforts to line one up so far have not been successful. And there’s the issue of its season. Four productions a year does not an opera season make, at least if you want to be taken seriously by the community and the larger opera world. Even the Santa Fe Opera, a summer festival that lasts only two months, puts on five productions a year. Until the BLO presents at least six operas a year – which could include repeats of popular successes and additional smaller-scale productions like it does in its off-site Annex series – it won’t have the gravitas of a major company. 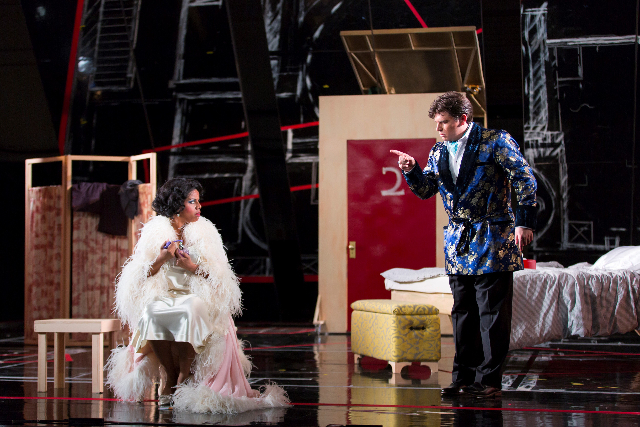 The lack of a major opera company remains Boston’s Achilles Heel as a cultural center. What city in the western world that pretends to be a cultural leader does not have an opera house? Maybe once it finally gets its own theater, even if it has to share it with smaller companies, the BLO will be able to expand its offerings. Now to the opera. “The Marriage of Figaro” is one of the most sophisticated comedies ever written and the fact that it is still performed, drawing smiles and laughter from audiences nearly 250 years after its premiere says something about how Mozart and his librettist Lorenzo da Ponte knew something basic and profound about human nature and what makes people laugh. The action of the opera takes place on a single day, the day Figaro, a servant to Count Almaviva, who lives with his wife in an estate outside Seville, will marry Susanna, the Countess’s maid. Complications arise – otherwise we wouldn’t have much of a drama. The Count is a lecher and has his eyes on Susanna. The medieval droit de seigneur, the law that allows the lord of the manor to sleep with a servant before her marriage, has been challenged – the Revolution brewing would put a final end to it, although as we know it didn’t put an end to powerful men taking advantage of those under their supervision – but the Count wants to reassert the ancient right with Susanna. The Countess, a noble long-suffering figure, knows that her husband has a wandering eye, hands and other body parts, and laments her fate as an unloved wife. The Countess’s page, Cherubino, just past puberty, is also in love with her – he is in love with every woman he sees, a source of much humor. And there is a woman, Marcellina, who insists she has the right to marry Figaro because he signed a contract giving her that right if he didn’t pay back a debt on time. 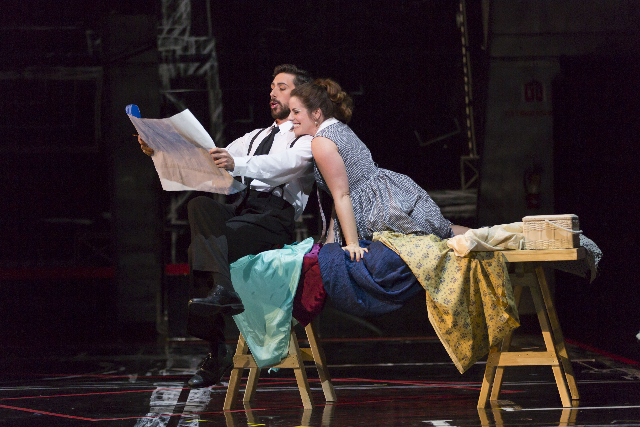 A comic highlight of the opera is the scene in which she and Figaro discover that she is his mother – “sua madre!” The Countess and Susanna cook up a scheme to trap the Count by switching identities. It all comes to a head in a garden at the palace in the middle of the night, and in the end, the opera concludes with one of the most noble ensembles ever written – the Count begs for forgiveness and it is granted to him, by all. That summary leaves out much that makes the opera fun, like, for instance, cross-dressing. Cherubino, the horny teenager, is played by a woman, who at one point disguises himself as a girl, in other words, a real girl playing a boy who impersonates a girl – it sounds corny, especially these days when there’s a drag queen on every block, but it guarantees laughter every time. (The music might have something to do with it.) Oh, and there’s also someone jumping out the window of the Countess’s boudoir – that would be, of course, Cherubino - to escape discovery by the Count, breaking a pot of flowers that becomes a recurring motif when the drunken and angry gardener brings it to the gathering as evidence of the out-of-control behavior he witnesses. In short, the plot is far too complicated to explain here – the opera as presented by the BLO lasts a healthy two and a half hours and it moves at a brisk pace with constant plot twists that make you wonder as the end approaches how it will all be resolved. And I have to admit that I have never seen a production that does justice to that conclusion, with the entire cast, some disguised, passing each other in the dark night garden. Mozart and da Ponte end the confusion by the equivalent of pulling a rabbit out of a hat – in the midst of the mayhem, the Countess speaks a few words, revealing the ruse to the Count, who immediately pleas for forgiveness – he had been courting her thinking she was Susanna - and the opera is concluded on a sublime note, even if all the plot threads are only barely held together. But with that final nonet, the entire cast singing together as one, only a pedant would demand rationality. John Conklin, the mastermind behind most of the BLO’s productions, and stage director Roberta Cucchi set the action in a villa in Italy during the 1950s, citing Billy Wilder’s film “Sabrina,” which starred Audrey Hepburn, as an influence. The updating gave costume designer Gail Astrid Buckley the opportunity to re-create the fashions of the period - full-skirted dresses for the Countess and Marcellina, capri pants and ponytail for Barbarina and a smoking jacket for the Count when he’s occupying his master of the universe study. Models of flashy Italian race cars, the Count’s enthusiasm, helped set the period as well. Conklin’s concept of suspending a tilted mirror over the stage to show the villa’s floorplan – he cites Lars van Trier’s “Dogville” as an inspiration – was less successful. It did no harm – it didn’t get in the way – but it didn’t add anything either. It should be noted that John Hancock Hall, although a handsome art deco space, was infelicitous for opera, muffling the sound of both singers and orchestra, the orchestra more severely. The fortepiano continuo on auditorium level was more prominent than it should have been, but Brett Hodgdon played with such verve, there are no complaints here. A special word of praise for Cucchi, here directing the BLO for the second time: Cucchi, who does most of her work in Italy, looks beyond broad concepts to the details, directing the singers every gesture, every stance, like she did so successfully last year in her direction for “La Bohéme.” Her approach paid off particularly well in the hilarious scene when Marcellina calls off her campaign to marry Figaro when she discovers because of his birthmark that he is her long-lost son. In a delirious sextet, a comic masterpiece, Marcellina, Figaro, Doctor Bartolo (who turns out to be Figaro’s father) and the others assembled, sing of the discovery “sua madre? suo padre,” which is enough to guarantee laughs, but Cucchi has each one of them gesture and move with individual specificity that deepens the humor. A brilliant scene. 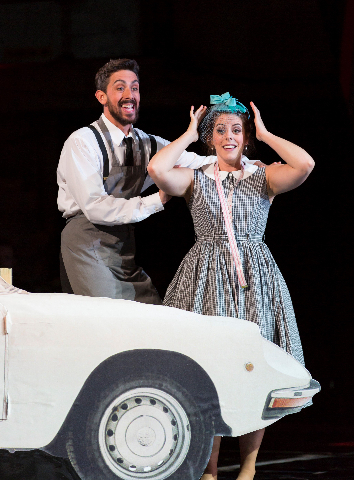 From the top: Evan Hughes, was a tall, lean and handsome Figaro with an expressive, richly grounded bass-baritone. In his first act aria, in which he challenges the Count in the battle of wits, “Se vuol ballare,” Hughes sang with masculine resolution. And he boasted of clear enunciation of the Italian text. He was well-matched by soprano Emily Bursan, who sang his betrothed Susanna with a nice bright soprano that was well-suited to the role. Like the others, Bursan was able to act as well as sing, both of which she did admirably. As the Count, baritone David Pershall played the cad with verve, singing with a gravelly bottom. He sang his great Act II soliloquy, “Vedro mentr’io sospiro,” in which he assesses his prospects, with almost existential doubt. Cucchi’s decision to show him drunk added depth to his depiction. The Countess, soprano Nicole Heaston, is the moral center of the opera and Mozart gave her two of the most moving arias he composed for the female voice. Heaston was a little warbly and metallic in the first, “Porgi amor,” in which she longs for her husband’s love and attention, but she was in fine vocal form for second, the great “Dove sono,” a precursor the Supreme’s “Baby, baby, where did a love go?” She sang it with warmth and feeling, her essentially light soprano showing its rich mid and low notes, while sitting in a wing chair in front of a screen both of which were printed with a Watteau-like fête châmpetre image. 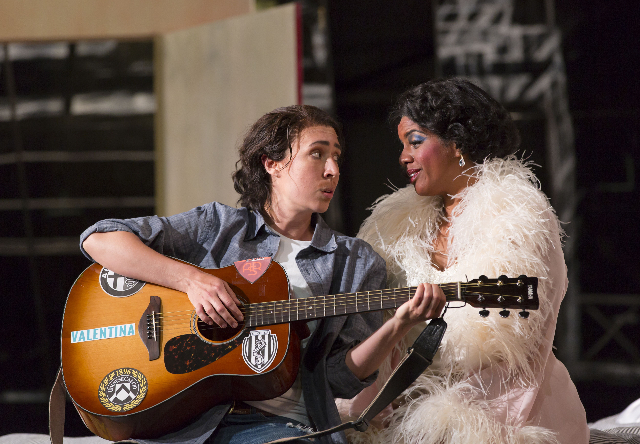 As Cherubino, mezzo-soprano Emily Fons was a revelation. Gangly, awkward, she captured the essence of a boy moving into adulthood in his mind but with a body that is trying to catch up to his desires She sang Cherubino’s great song, “Che voi sapete,” as a folk song, (mock)-accompanying herself on guitar, her blue-jean clad leg up on a chest at the foot of the Countess’s bed. A brilliant performance. As Marcellina soprano Michelle Trainor also delivered a brilliant performance. An ebullient comedian, she stole every scene she was in with her pure joie de vivre. I will always remember her in her iridescent (green and mauve) gown doing an exuberant twist in the wedding party scene. Trainor has a big voice, which she has learned to modulate for the space and her company. An alumna of the BLO’s emerging artist program, I suspect she will have a big career. 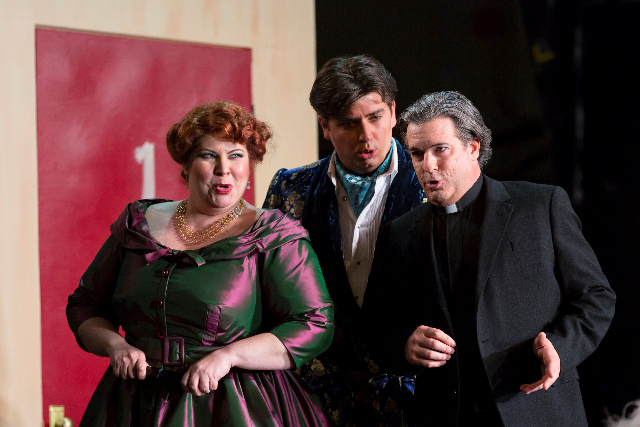 Another emerging artist alumnus, baritone David Cushing, who sang Doctor Bartolo, is also on the verge of a big career. He sang his aria, “La Vendetta,” with wit, balancing his thirst for justice for Marcellina with a sense of amoral opportunism. In smaller roles, Matthew DiBattista as Don Basilio, Simon Dyer as Antonio the gardener, Brad Raymond as Don Curzio and Sara Womble as Barbarina were all fine. As the Bridesmaids Felicia Gavilanes and Emma Sorenson were charming.